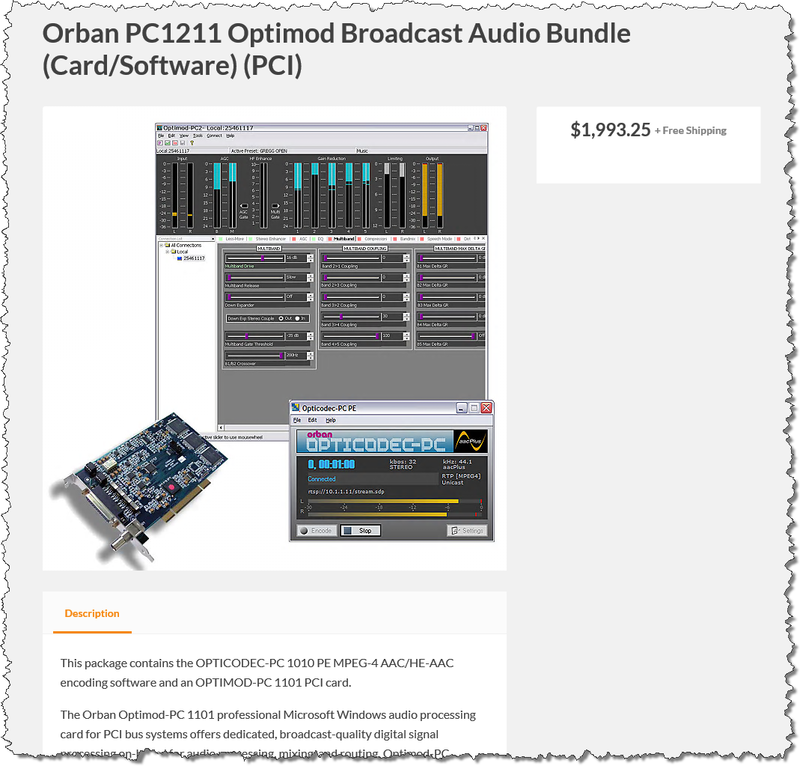 This listing comprises the Optimod processing card, XLR cables and paired AAC streaming software install file v3.8 (which is keyed to the card serial number and will therefore only work with this card). No unpictured documents, cables or accessories are included. A screenshot taken during the testing of your card will be included in the package for your peace of mind. The PC1101e hardware drivers may be downloaded from the Orban FTP site. I will send the buyer the streaming software electronically. This package contains the OPTICODEC-PC 1010 PE MPEG-4 AAC/HE-AAC encoding software and an OPTIMOD-PC 1101 PCI card. FREE players include Adobe Flash, RealNetworks RealPlayer, Apple QuickTime and Nullsoft Winamp, among others. True streaming providing content security - not progressive downloads from a web server. Hardware players include Apple iPhone/iPod Touch, Terratec Noxon2, Roku Soundbridge, Chumby. Most efficient audio codec currently available. Most natural sounding lossy audio codec currently available. Provides higher audio quality for a given bitrate than other audio codecs. Fewer audible coding artifacts for a given bitrate than other audio codecs. Dramatically superior to MP3 and WMA. AAC is the choice for the number 1 music download service: Apple iTunes. HE-AACv1/v2 aka AAC/HE-AAC (aacPlus) is the choice for standards-based 3GPP mobile streaming. Maximizes network reliability minimizing buffering. When used with OPTIMOD-PC, OPTICODEC-PC provides true entertainment-grade audio quality. Accurate peak-hold audio level metering. Robust network connectivity with auto-reconnect. Packet optimization for increased efficiency. Extensive, flexible metadata support using direct connect, Serial or Ethernet interfaces. Optimod-PC works great for both live streaming and on-demand programming. Its three on-board Freescale DSP56367 DSP chips provide a loud, consistent sound by performing stereo enhancement, automatic gain control (AGC), equalization, multiband gain control, peak-level control, and subjective loudness control. Optimod-PC's audio driver allows it to appear as two standard sound devices to the computer's operating system. With one Optimod-PC, netcasters can replace selected content (such as commercials in a program originally created for radio broadcast) and inject watermark encoding for ratings. This approach maintains the same audio processing path on both program and inserted audio, delivering a polished, consistent sound while eliminating the number one listener complaint: loud commercials. 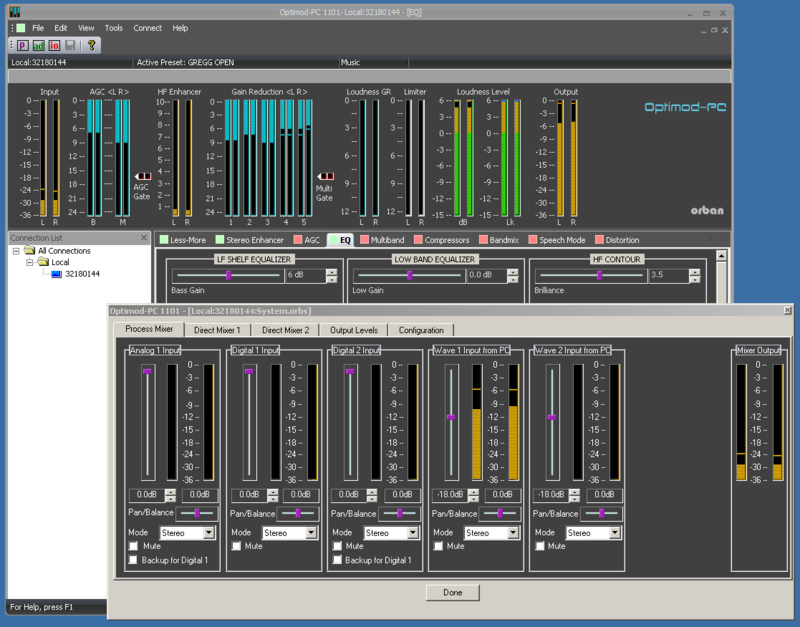 Optimod-PC audio processing works with all digital transmission media and channels. It tailors your audio signal to help you compete in audio netcasting, HD Radio (both primary and multicast digital channels), DAB, DRM, and other dedicated digital radio services, FMExtra and other digital subcarriers, mastering, audio production, and many others. Optimod processing algorithms simultaneously control audio gain and peaks, artistically, musically, and naturally, to give the illusion that processing is not taking place. Optimod algorithms intelligently adapt themselves to the input program material. 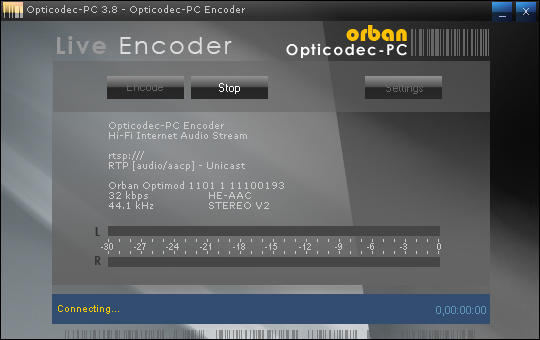 Once Optimod-PC is tuned for the sound texture required for the broadcast or netcast format (which is made easy by the many format-specific presets), it will provide excellent consistency regardless of the level or texture of the original program material. Its automatic gain control and equalization achieve a consistent sound, while accurate peak control maximizes loudness. Booming bass is tightened; weak, thin bass is brought up; highs are always present and consistent in level. Optimod-PC is also an excellent mastering processor, offering soft knee multiband compression with knee and ratio controls available separately for each band. Optimod-PC comes with over 20 great-sounding presets that make it easy to create a sonic texture that's just right for your target audience.